Dieu du Ciel was born out of the collaboration between two biology student beer geeks who turned their passion for experimenting into a successful craft brewery in Montreal a little over two decades ago. 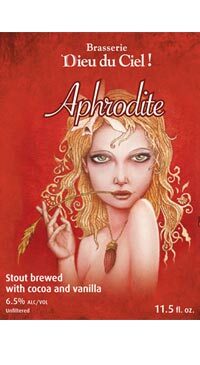 Dieu du Ciel’s Aphrodisiaque is like the most delicious chocolate milkshake a beer-drinker could ask for. Loads of rich dark chocolate, light french vanilla coffee accents, and roasted caramel flavours with just a subtle floral hop character to help firm up the surprisingly dry finish. The texture is like silk and you’ll be surprised how quickly your glass empties.